Hi and welcome to the first of many Valentine’s Day inspired content! I’ve been pretty excited for Valentine’s Day this year. Maybe it’s because after the holidays being over with I’m eager to celebrate the next thing, or maybe it’s because January was super long, cold, and boring. Whatever the reason, I am looking forward to all things pink and red and covered in chocolate right now! I know I was MIA from the blog last week, but that is because I got my wisdom teeth out. It made eating and thinking about food very painful (in multiple ways: painful in a physical way but also painful mentally and emotionally because I missed cooking!) so I couldn’t bring myself to blog anything new. The good news is I am on my way to full recovery so expect to see some delicious things soon! I totally underestimated the whole wisdom teeth thing. I mean I knew it would be painful but for me it wasn’t really bad until like 4 days after the surgery. Weird, right?! Thankfully it’s over and hopefully I never have to experience something like that again. 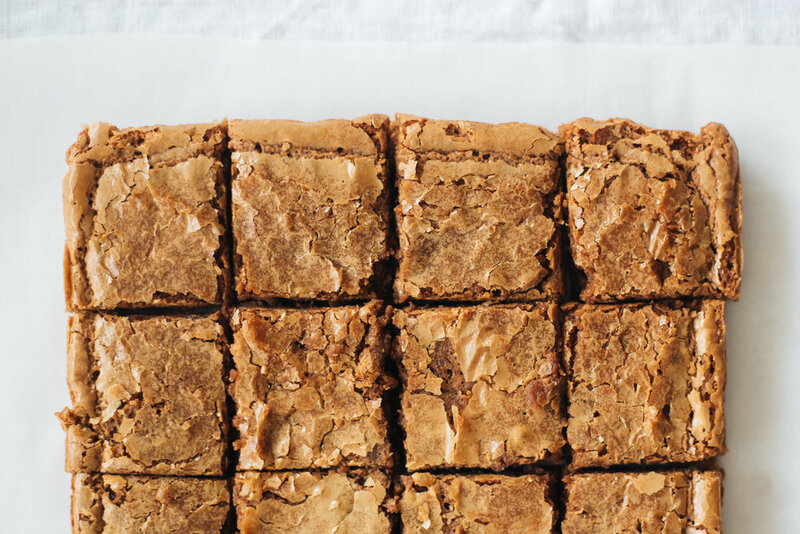 Let’s move on to these decadent, rich, smooth brownies. OMG. I do love a good brownie, but I’m going to be honest and say that in the past I just haven’t found a good from scratch brownie that I liked. I mean there were some that were okay but in the end I preferred a box mix because it was easier and tasted better (don't judge me!). Well let me tell you that if you are in the same camp I was in, things are about to change!! 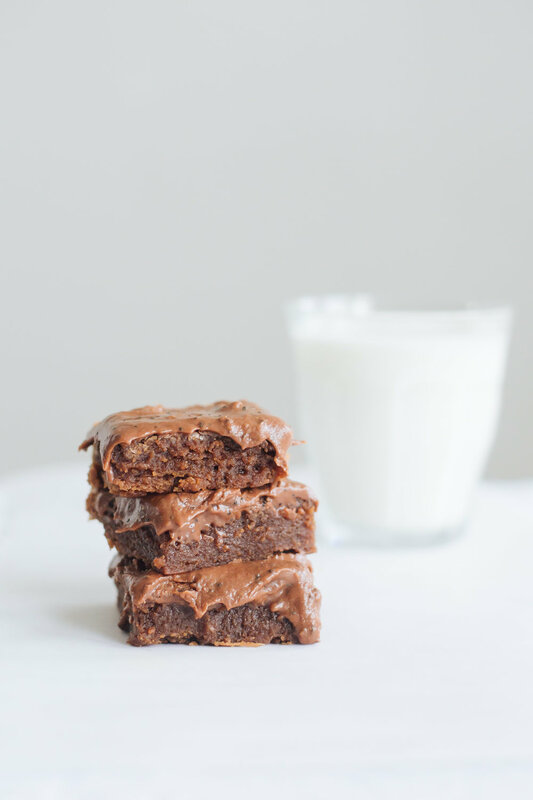 These brownies are one bowl, so easy, and fudgy. I love that the batter doesn’t even use cocoa powder and instead opts for real chocolate (SO much better!). I cut down the sugar a bit to go with the (insanely delicious and simple) frosting. If you don’t have earl grey or are just not into it, you can leave it out. Normally when I make desserts we do not eat them all, but we definitely ate every. single. last one of these! These are part of a fun Valentines Day recipe roundup featuring some awesome bloggers! Check out their links below! Preheat the oven to 350°F. Grease and line a 9x9 square baking dish with parchment paper or foil. In a small saucepan, melt the butter and chocolate together over medium heat, stirring until everything is mixed together. Pour into a large bowl, and stir in the sugar. Add the eggs and vanilla and stir until incorporated. Lastly, add the flour and mix until combined. Pour batter into prepared pan and bake for 25-30 min, or until toothpick inserted in center comes out clean. The top of the brownies should be crackly. Let cool in pan before adding frosting. To make the frosting, melt butter (either in a small saucepan or by 30 sec increments in the microwave). Stir in the cocoa powder. Add the powdered sugar, the contents of the tea bag, vanilla, and milk. Stir with a spoon until everything is combined. Add a little more milk if frosting is too thick. 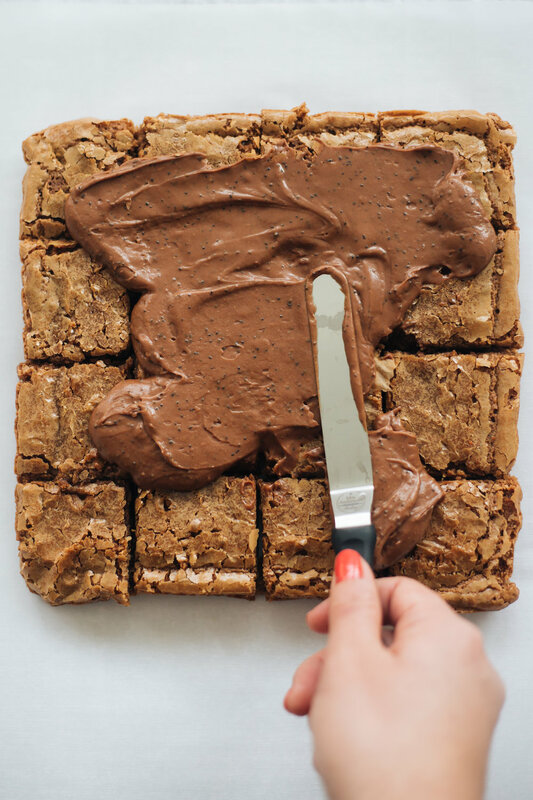 Spread frosting over cooked brownies with a spatula, and cut into squares!